We use English books which have been specially edited for language students who are not native English speakers. 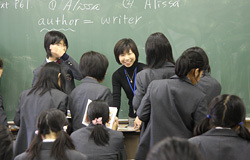 Speaking and reading is all done in English, so students come to understand the language without translating each word into Japanese. From the first grade in junior high school, we encourage students to read their favorite books during English classes. As they can read what they choose, their ability to understand the language is established. There are more than 18,000 English books available to students and they can borrow books every day. Our aim is that each student should read more than 1 million words during their three years in junior high school. From the first grade in junior high school to the first grade in high school, they take conversation classes taught by native English speaking teachers. These classes are small (about 20 students), so there is plenty of opportunity for students to speak English. In the first grade in high school, we cultivate listening and speaking skills using an advanced text. There is an optional course to learn more about discussion and debate in the second grade. The optional courses become available from the second grade in high school and students are counselled bearing in mind the university they wish to go to. In the third grade in high school, we select teaching materials that may be useful for university study in the future, including scientific essays and English articles. Students are expected to express their opinions in English in all grades. 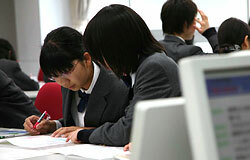 There are also many opportunities to write essays in English. The themes of these essays vary, but for students in upper grades the main subject areas are the environment, culture, ideology or social issues. There are four fields in the language study – a general study of the subject, reading, writing, speaking and listening. Reading and listening concentrate on receiving information, whereas writing and speaking are about relaying information. 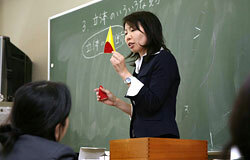 The purpose of studying Japanese is to improve a student’s ability to receive and relay information using the language. This is the basis of any study. We focus on teaching students to read and understand explanatory notes, critical essays, novels and poetry as well as to express themselves in the Japanese language by writing essays. 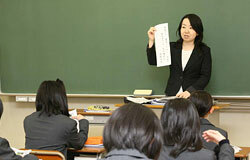 Students improve their ability to read, write, speak and listen in Japanese, step by step, in six years at school. Sometimes we use a whole book as teaching material. Furthermore, we make them create a POP advertisement and create magazines based on their own research. We also encourage students to memorize Hyakunin Isshu (a card game with traditional Japanese poems) from the first grade in junior high school to prepare them before they start learning classic Japanese. There are regular small exams using texts which conform to the Japan Kanji Aptitude Test for Chinese character (kanji) study. 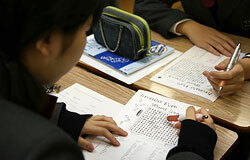 Students aim for the Kanji ability equivalent to the Japan Kanji Aptitude Grade 2 by the end of junior high school. 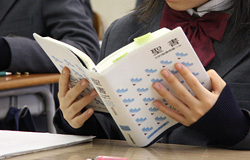 In high school, we use the text for university entrance exams to increase vocabulary and refine students’ kanji ability. 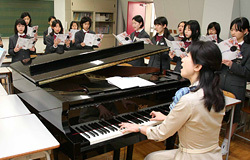 Based on the study in junior high school, the teaching of Japanese in high school is separated into “modern Japanese” and “classical Japanese” to deepen students’ knowledge. From the second grade, curriculums differ between arts and science courses, taking into account the requirements of university entrance exams. We also encourage students to keep a daily record of their reading throughout their six years of study in order to motivate them and help them realize how beneficial extensive reading can be to their lives. Social studies is not “a subject that requires learning by rote”, but “a subject that helps students “think about the world we live in”. 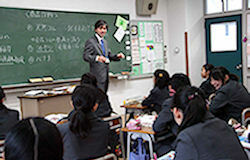 Students learn geography in the first grade and Japanese and world history in the second grade in junior high school. Based on the first and the second grade study, students study modern society. They learn what they are, how modern society works and how they should live in the society as a human being. Our students are all female, so we teach social studies and give career guidance bearing this in mind. We teach and discuss various themes – including how they should live as a woman, what is sexuality and life in general, and women and their work – through classes, homerooms, and academic counselling. These classes and homeroom discussions are useful for students when they decide what to major in higher education. In civics class they learn about politics and the economy through the Stock Market Game from which they actually see the trend in society. In social studies class in the first and the second grade in junior high school, students learn how to collect information, and organize it and how to make a presentation. In the third grade, they choose their research themes, making a clipping of a newspaper article. They need to understand the structure and background of their themes to find a solution to the issue they chose. Then they write a report or an essay in their own words. When ready, they present the results of their research in the class and discuss this with other students. Such a curriculum enables students to gain the knowledge and experience which is required as they move into the wider world and to develop the skills required to absorb and edit necessary information without losing their identity. There are many students who wish to help solve social problems in Japan and the rest of the world, and they select a university or occupation accordingly. World History A is a compulsory subject for the first grade in high school. Students look at the background of modern social problems. Ethics is also a compulsory subject and they learn the “frame of knowledge” in modern western Europe. They also look at the history of natural science and social science, and learn the academic way of approaching these subjects. This is an area that appears frequently in Japanese and English tests for university entrance exams, so this cultivates the cross-curriculum ability in students. Politics/Economics is a compulsory subject for the third grade. Students are required to understand the background and structure of modern social issues and to develop the ability to present policy. For the second and the third grades in high school there are also optional curriculums for the university entrance exams. We help students to gain not only “the skill to pass the exams” but also other skills that will be useful for future study in universities and further as they go out into the world. We aim at raising students’ mathematical thinking. Therefore, what we value is not only to work out the “correct answers”, but also the “process” to get those answers. Logical flow is very important in mathematics. *Learn and master how to describe something logically. *Do not be satisfied with just a correct answer but always think about another way to approach it. *Build your own study habits using a workbook. If students study keeping these points in your mind, they can find a joy of discovery and pleasure of understanding during the class. As a result, their mathematical curiosity will be boosted. From high school, classes are organized, based on students’ level, to improve their basic knowledge and application skills. When students become the second grade in high school, the classes are divided into two courses, Arts/Literature/Economic course and Science/Technology/Engineering course. Depending on the university they hope to go, students choose and attend one of the two courses accordingly. 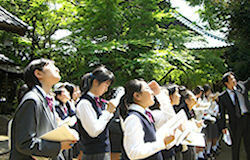 Then students concentrate on studying to pass the university entrance exams. 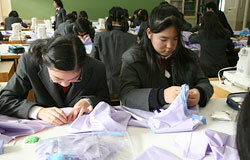 Students are encouraged to develop a scientific mind through their own research and experiments. The study of science is not only about gaining knowledge but also about gaining a real understanding of nature based on real experience. Five laboratories (Physics Room, Geoscience Room, Biology Room and two Chemistry Rooms) are located on the third floor of Building 3. There is also a planetarium located on the same floor. 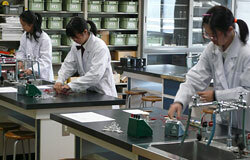 Each room is equipped with all the necessary equipment, and each is able to accommodate many kinds of experiments. There are original experimental manuals prepared for each curriculum, so teachers can teach each subject in an individual way, without necessarily relying on set texts. Each student plays a leading role during experiment class. Everything has to be done by herself including conducting dissection and scientific experiment. Teachers bring out students’ interest and curiosity in natural science and cultivate an ability, which is useful when they study to enter various Science/Technology/Engineering universities. We teach students how to keep their minds and bodies healthy by instructing them in various types of physical training including ball games, athletics, gymnastics and dance. We also teach eurhythmics – an exercise which is based on musical rhythm. Eurhythmics was developed more than 70 years ago as a basic training method for music, dancing and other exercises. In the eurhythmics class, students listen to the rhythm of the drum and the voice of the instructor. Then they translate these sounds into body movements. Eurhythmics exercise improves the transmitting of commands from the center of the brain to nerves and muscle. As a result, students’ concentration improves and body movements become more fluent, more efficient and more expressive. We also teach “Naginata (the use of the traditional Japanese long-handled sword)”. This exercise teaches students courtesy and respect for other people (mental effect) and how to maintain beautiful postures and movement (physical effect). In the first grade of junior high school, students learn basic movement and in the second grade the rhythm of Naginata. 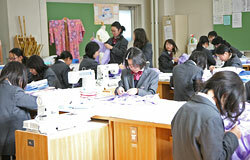 Home economics class is designed to teach students the skills necessary for “life” and “living”. The purpose of this class is to let students review their living and master the skills to create their own lives. We teach them to become independent people who are also rich in humanity. They learn not only about family life, clothing, food, housing, family and development of children and information and computer technology but also how to apply the knowledge to actual living through planning, research, study and production. Students actively participate in laboratory exercises, and through them they enjoy working and feeling a sense of accomplishment. We encourage them to find “why” in daily life, and find a way to live scientifically and proactively. Students lean the importance of privacy and copyrights in order to use ICT (Information and Communication Technology). The study also teaches them to collect information and develop good judgment. Furthermore, students are divided into small groups, and work on the task which are set by actual companies in order to gain communication and presentation skills, so they can express and present information appropriately. Depending upon the theme, each group is set, and each student group does their own research and comes up with a solution. Each group then makes a presentation to the representatives of the company. This exercise teaches students how to overcome any differences of opinion that can arise in a group, to defend their own points of view while respecting other people’s opinions in order to find a better all-round solution. Through this experience, they attain problem-solving and negotiating skills, and learn how to co-operate with others, all of which are important in other areas of study. 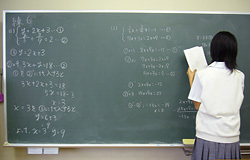 In the first grade of junior high school, this is a compulsory class held two hours per week, and again during the first grade in high school, for one hour per week. There is an optional class of two hours a week for the second and third graders in high school. 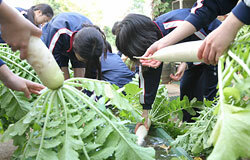 Students get fond of gardening and the soil through cultivating flowers and vegetables. They also experience the wonder and joy of seeing them growing day by day. We basically don’t use chemicals, so our horticultural lessons are also an opportunity for students to consider environmental issues. 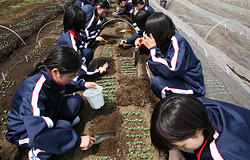 Not many schools offer horticulture as a compulsory class in which students have the opportunity to get close to the soil. There are many alumni who studied agriculture at universities and have gone on to become successful in their fields of study. 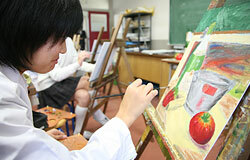 The Art curriculum consists of music, art and ‘Shodo (Japanese calligraphy)’. Classes mainly involve practical work and the mastering of certain skills, but students also learn more about themselves through a variety of creative activities and music performance. As a result, they attain the ability to express themselves freely and spontaneously. Our aim is to cultivate sensitivity to art works in general and to guide our students to find beauty in the various forms of art. In art class, students start by sketching outdoors and paint these sketches in oil paint. Teachers also introduce students to other disciplines including etching, design and poster production, so they fully develop their creativity. In music class we teach not only Japanese music but also works by Mozart and Handel in the original language and the recorder ensemble. We hold a choral competition, and sing hymns in chorus at the school Christmas event. In Shodo class, students learn various formats and fonts, including regular script and semi-cursive script. They develop the ability to express themselves through their work by brush or pen. We focus on “writing beautifully”. The Bible contains the word of God. Through it His word speaks to us and becomes “the strength” that appeals to the world, “the light” that shows the truth, and “the love” that saves human beings. The contents of reference books for the study or legal documents are sorted by item and written with a specific theme. However, the Bible is different. God speaks to us, the readers, through the long historical drama of human beings written in the Bible. We encourage students to listen to its messages: “Who are human beings?” “What is the meaning of life?” and “How should we live?” In doing so, students can further open their inner selves.